It 's Sunday afternoon. We've been to Sunday School and had a great time exploring the story of Zacchaeus from Dr. Luke's account with some of the sweetest and most insightful friends. But, it's not really the story of Zacchaeus, the wee little man who climbed a tree to see Jesus. It's really the story of God's Divine appointed intervention in a person's life. It's about God reaching out and touching and spending time with a person who recognizes he is totally insufficient within himself. It's about the change God desires to make and will make within everyone of us when we are willing to climb the tree that may embarrass us just so we can see the Holy One. I pray this Sunday afternoon that you and I will experience the Holy One this week as go about our busy or not so busy routines. We may have a divine appointment ahead! I thought I would show you what I wore to church this morning and then some possible options. I bought this Le Suit outfit several years ago while still working and it remains one of my favorites, even though I have lost some weight since buying it. You will notice it has a gold thread running through the weave which gives it an interesting sheen. This morning I chose to wear a sweater that complimented the texture of the suit. I have used so many different looks with this beautiful suit which dresses it up or down depending on the occasion. For instance, purple makes a nice contrast with the gold threads. I especially like wearing this lovely Mother-of-Pearl necklace which is simple and not over-powering. I also have a multi-strand purple beaded choker which is interesting and a bit more formal. With a white sweater or blouse, this metal necklace adds a visual weight and balances the dark suit. For a more casual look, I like the strip combined with this simple, interesting necklace. The large transparent stone creates interest while allowing the strips to show. How about adding a simple colorful tee to an otherwise dressy suit. I love this Black Market/White House knit tee and the chunky complimentary necklace. The contrast pleases me. The long multi-strand chain is an option with an open jacket. And this is my all-time favorite necklace which I wear with just about everything. You can't go wrong with this beauty! I have a friend who's trademark is a scarf. 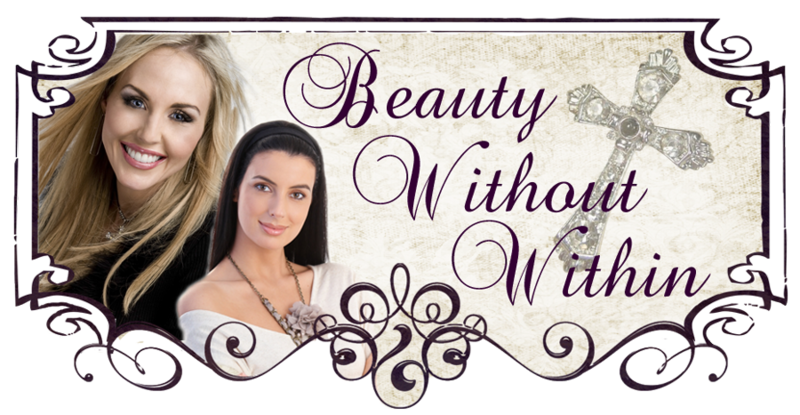 She may wear a small square one knotted around her neck, or a long rectangle under a lapel. She may even drape a large square over a shoulder with a broach pin or use one as a beautiful shawl. There are so many options. These are just a few I found in my selection that would be great with this particular suit. I hope I have given you food for thought for taking advantage of the basics in your closet. You just don't need so many clothes when you have mix and match options. 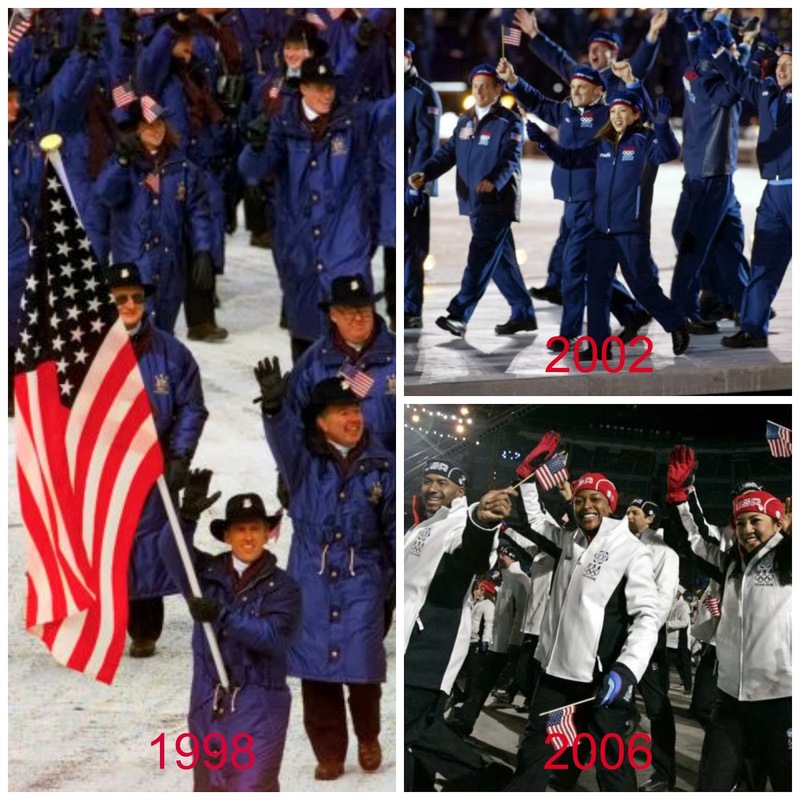 Are you looking forward to the Winter Olympics? 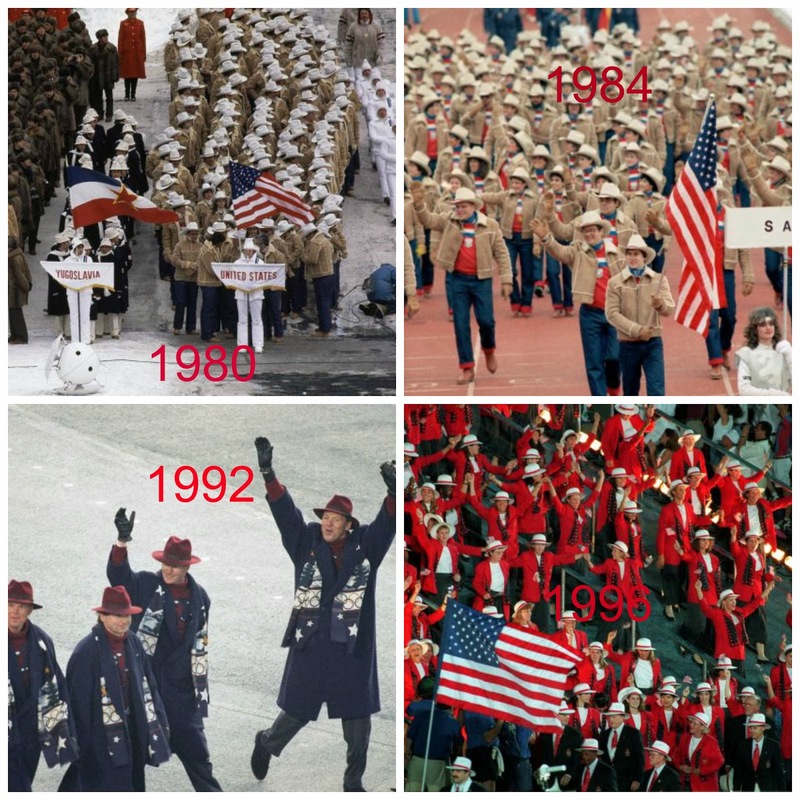 I enjoy watching the Olympics regardless of the season, but I do especially enjoy the winter games. 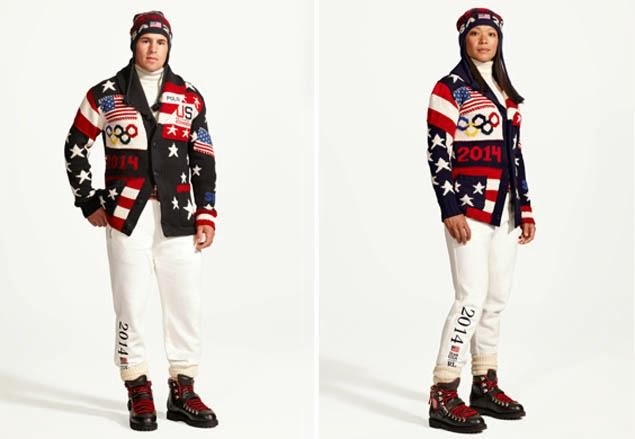 And the athlete's ceremony fashions are always quite interesting. 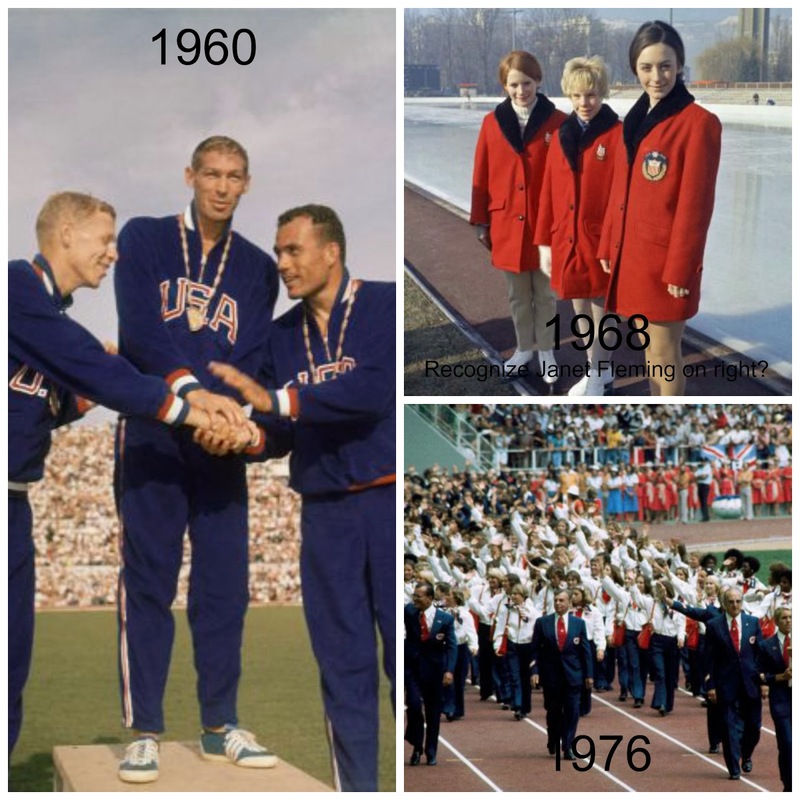 Do you remember the huge snafu before and during the Summer Games about the garments being made in China? Well, this week David Lauren, Executive Vice President of the fashion empire's communication and marketing announced that the Ralph Lauren designed outfits "would be 100% made in the USA." 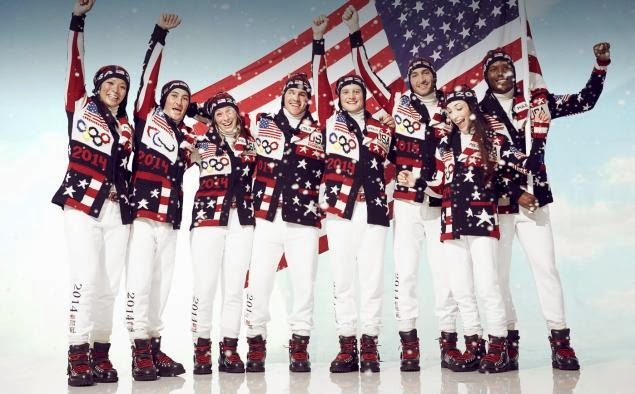 "We wanted to honor the heritage of the Olympics, the athletes and celebrate our country. The handcrafted patchwork of the sweater is an icon of Americana." Sure enough, the Oregon wool was spun in Pennsylvania and knitted into sweaters in California. The ensemble also includes cream-colored turtleneck, white fleece pants, wool peacoats, black boots with red laces and a cotton belt. I rather like it but am afraid one of these $595 cardigan patchwork sweaters may show up for someone's "Ugly Christmas Sweater" day a few years from now. The wool peacoats aren't bad at all. 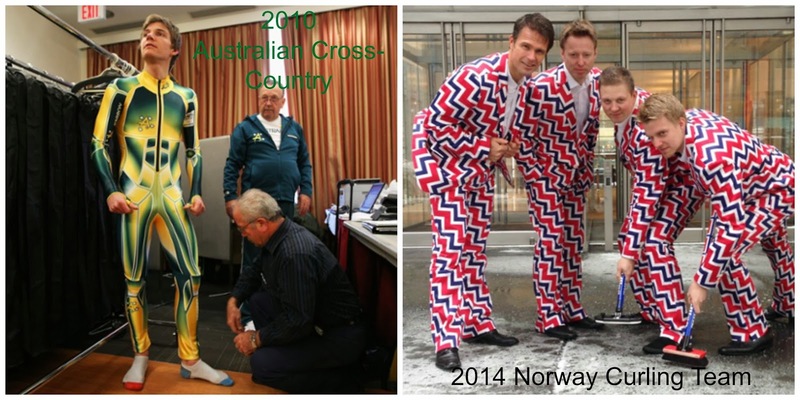 I thought it might be interesting to look back at some Winter Olympic Fashions from years past. These no doubt get the prize for the strangest! 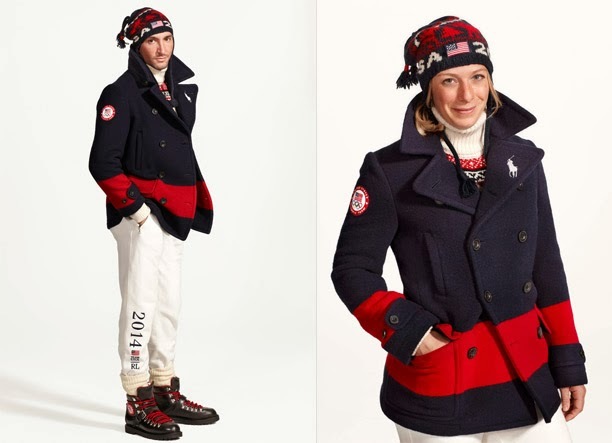 I suppose all things considered, the Ralph Lauren, Made-in-the-USA patchwork sweaters aren't so bad after all. I really am aware that it is quite late in the day to be posting a blog that is generally seen in the mornings. As our desktop CPU needed to spend a few days with the Computer Doctor, we didn't get it back until late yesterday. This morning had its own adventures and activities such as a trip to the gym and lunch with a group of special friends. Priorities! So, I'm thinking perhaps the two or three readers who follow my blog won't mind when it's posted. Thank you Joyce for Wednesday Hodgepodge - 159. The last time I bowled was probably close to 10 years ago while entertaining visiting grandchildren. Do I like it? Surprisingly yes, I used to enjoy bowling once in a while. In fact, right after we married, we joined a bowling club along with church friends and I got fairly good at it. Do I want to go to an alley and do it again? Not especially! My feeling is that anyone who willingly places themselves in a public position, whether it be a high school or professional athlete, a church or community leader, a politician or a parent, should accept the responsibility of setting a good example for anyone who might think of emulating their behavior. I think last Sunday's pre-Superbowl games offered us prime examples of one who accepts his role as a leader - Broncos' Peyton Manning and one who doesn't - Seahawk's Richard Sherman. The only way I eat oatmeal is in a breakfast smoothie. Cookies are not bad, but not my favorite. I have several books I would like to read this year. I download books from Bookbub and have them stored on my iPad. Some examples are: "Gazing Into Glory," "Love Amid the Ashes," "Rolling Thunder," "Princess," (a true story of life behind the veil in Saudi Arabia), and one not in my library yet, is "Duty: Memoirs of a Secretary of War" by Robert Gates. "You finished strong!" I most desire to hear my Heavenly Father say, "Well done my good and faithful servant!" "Sleepless in Seattle!" I will never tire of seeing that movie and keep waiting for the sequel. Poodle skirts with all those starched and netted petticoats, and bobbie socks. Does that age me or what? Regarding question #4, I wanted to share with you a book I am currently reading. 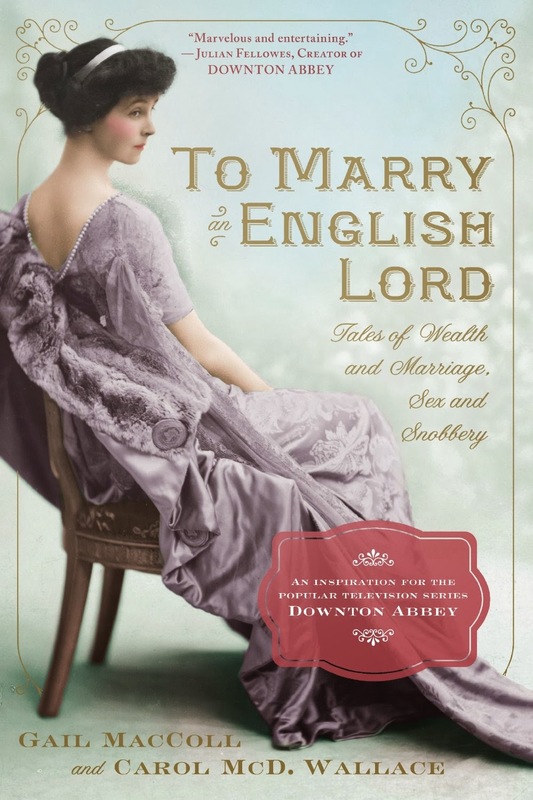 With the hype over Downton Abby and European society, this is a timely written book. It is not fiction but an account of the early aristocracy of New York and the evolution of the "Knickerbockers" and American society as well as its influence on the established European aristocracy and vice versa. It is very interesting and enlightening. I now understand the old, once used reference of "Miss Astor" regarding one's snobbery or pretentiousness. "American youths are pale and precocious, or sallow and supercilious, but American girls are pretty and charming - little oases of pretty unreasonableness in a vast desert of practical common-sense." And such was the view of young American beauties thrust upon European society by Mothers eager to see their daughters "marry well." Actually, I am writing this on my iPad on Sunday night while reclined and watching the SF 49ers play the Seattle Seahawks. Since the Seahawks beat the Saints twice, I really don't like them, and neither do I care for Pete Carroll, their coach. Besides, I think the 49ers are the better team and will make the Super Bowl matchup with the Broncos a very enjoyable game. So Geaux San Francisco! Hubby and I are still enjoying our vegan diet and are finding some very delicious recipes. When I get my desktop CPU back from the computer doctors, I'll post some of our favorites. As I'm sure you are all aware, the color for 2014 is Radiant Orchid. It is a lovely shade of purple. Do you usually try to incorporate the color of the year to your wardrobe? These are a couple topics we'll discuss when the computer comes home. Probably so! Hubby seems to think so some time and I'm sure my children would agree that I have seemed pretty unmovable at times. I am the first-born and have been known to be forceful when my way is challenged. I am a fighter when crossed. That being said, I have asked God to make my heart tender and to mold me into the person with whom He would be most pleased . My instinct is still to fight so the Holy Spirit has His hands full with me. But, He often gently reminds me the fight isn't mine, and most of those battles I choose really aren't worth fighting after all. I would fight for my family any day, but even then, the battle is His and I am learning to let go and let God. I love everything about winter! But, to narrow it down to two things, I would have to say the cold, dreary, stormy days with a fire in the fireplace and winter clothes. I love the turtle necks and sweaters and boots. Yes, I love winter! I have not tried guava and really have no clue what it is. I have tried all the others at least once and my favorite is the kiwi. Kiwi is good any time of the year. I have to take issue with the "when all else fails" part, because I don't think doing the right thing should be a last resort. Choosing to do what's right should be the first and only option. Discerning what is right in all circumstances is not always easy, but it should be our only desire. I don't ski but would love to visit St. Anton, Austria under any pretense. I will go into more detail later, but the last thing I looked for online was vegan menus and recipes. "Unrepeatable!" This is a new year, a new day never to be repeated again. I pray God will help me see each day and each opportunity to be kind, to be nice, to be used by Him. Each day is precious and an unrepeatable treasure. Hubby and I don't make resolutions but we have decided to become healthier this year. While with our Indiana family, we watched the film "Forks over Knives" (highly recommend watching this!!!) dealing with the importance of eating plant protein over animal. We already have a very rigorous workout routine five days a week, and we don't eat unhealthy; however, we are resolved to make a greater effort to do what we believe is best for us right now. We have for the last several years had a protein smoothie for breakfast after returning from the gym. But, I have started being creative with the contents. If you don't have a Ninja yet, you will want to look into getting one. There are so many uses, but nothing makes a better smoothie. Banana, Apple, Orange, Strawberries, Blueberries, Pineapple, Kiwi, etc. Carrots, Celery, Bell Pepper, Cucumber, Asparagus, Cooked or raw Squash, Brocolli, etc. You get the picture. Use a variety of healthy items, even leftovers. I use Almond Milk and water to mix and make it drinkable. In the future, I will be sharing some other recipes that I have tried. A vegetarian diet is not for everyone but it seems the right thing for us at this time in our lives. I'll keep you posted. By the way, I had my one-year checkup with my cardiologist today and he said I was "perfect." Now that must be taken in context, but he did confirm that I am doing all the right things and it is hopefully paying long-term benefits. Go out and be healthy! Several months ago I read a post that absolutely captivated me. It was written by one of my favorite bloggers, Elizabeth at Just Following Jesus. She admitted getting the idea from one of her blogger friends, so I hope neither of them will mind my borrowing their idea, but in no way their personal experiences. I am from the piney hills and red clay soil of north Louisiana. I am from a country preacher's modest home provided by a rural, conservative congregation, with constant red sandy floors scrubbed daily on her knees by a meticulous mother who couldn't bear the thought of her baby girl crawling on such. I am from another parsonage with a tree stump front porch step also kept as clean as possible by a devoted mother and grandmother. I am from a time when it wasn't uncommon for a grandmother to live in the home and hold a child on her knee and read and tell stories to. I am from a Father who pastored three small country churches one of which provided fried chicken and mashed potatoes every Sunday. pinches from Mother when I was an over-zealous squirmier. I am from a Mother who taught that a table is to be set properly and three meager, yet well-balanced meals a day are to be enjoyed with the whole family but not much laughter; that is until we girls along with "Daddy" convinced her that food tasted much better when sides were splitting over some silly happening during the day that must be shared while the family was all together. who demonstrated God's love on a daily basis. to pin-curl our hair every night before rollers were invented. I am from sharing a bed with a younger and much prettier and sweeter and smarter sister. I am from catching fireflys at night and pinning them on the wall above my bed and watching until they no longer flicker. I am from a prolific watermelon patch where favorite boy cousins take you and insist a melon is better if dropped on the hard clay soil and eaten on the spot. And he was right! 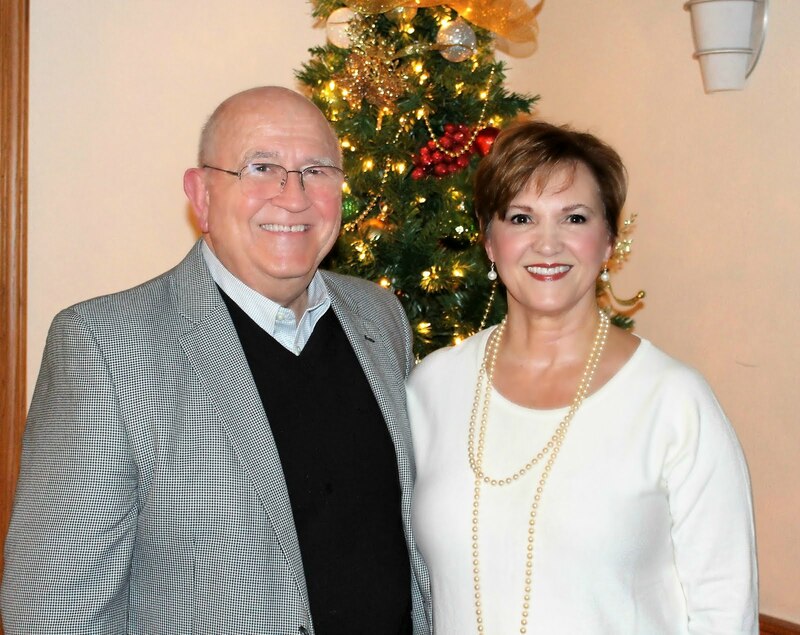 I am from another parsonage set behind the big white church house on the fringes of Acadiana with people who speak the English language with a Cajun accent and insist they be called "Aunt" and "Uncle." I am from this "heathen" land that soon becomes home with loving and giving people who delight in every opportunity to party and visit and play games and eat delicious although strange foods and celebrate strange customs such as loading up all the kids in the community onto a flat-bed truck and taking us around to back-wood homes where people raise chickens they don't mind wringing the necks of and adding to an ever bulging crow-sack for making a huge community-wide sauce piquant. I am from playing all day in the woods and exploring a hidden world under trees and across gullies. I am from building a Texas town and hideouts around the blown-down trees of a recent hurricane. I am from even another white parsonage this time set beside a large white church house and across a busy road from a train track and people don't want to be called "Aunt" and "Uncle" and no one even knows what turtle in a sauce piquant or gumbo tastes like. I'm from a home where Mother has to go to work for the first time, and we ride a bus home from school and open a can of asparagus and eat it with mayonnaise for an after-school snack. I'm from a community that was never home and that gave my preacher dad good reason to go back to Acadiana where people love you and will be your friend for life if you don't ever make them an enemy. I am from strong athletic programs in Class C schools where every one is encouraged to play at least one sport and the whole community turns out for a ballgame, rooting loudly for the home team. I am from a place where a special lady recognized I might have a talent for singing and offered to give me free voice lessons. I am from a small commuter college where students thought I was pretty enough and nice enough to be their "Miss" whatever. I am from knowing I never wanted to be married to a minister who met and fell in love with a minister. who have blessed me with seven of the most amazing grandchildren in the whole wide world. 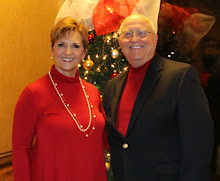 I am from having served in five churches with my Music Minister husband and been blessed and angered by church members and staff members who helped me grow in spite of myself. from another 20 years working with students and administration in a technical college. I am from reaching the time to retire and never regretting making that decision. I am from being disappointed and frustrated with a citizenry who is complacent enough to elect twice someone to the highest office in the land without ever considering the consequences to our nation of doing so. I am from loving to spend time with my two younger sisters at every opportunity. I am from looking forward to having time with my children and grandchildren. I am from the family of God and brothers and sisters in Christ who love Jesus with all their hearts and desire to know Him more and to serve Him more. I am from desiring to be more like Christ every day of my life. I am from the homesickness of missing beloved parents and from looking forward to being with them and other loved ones in the presence of my God and Lord and Savior Jesus Christ. Thank you Elizabeth for your "I Am From" inspiration. 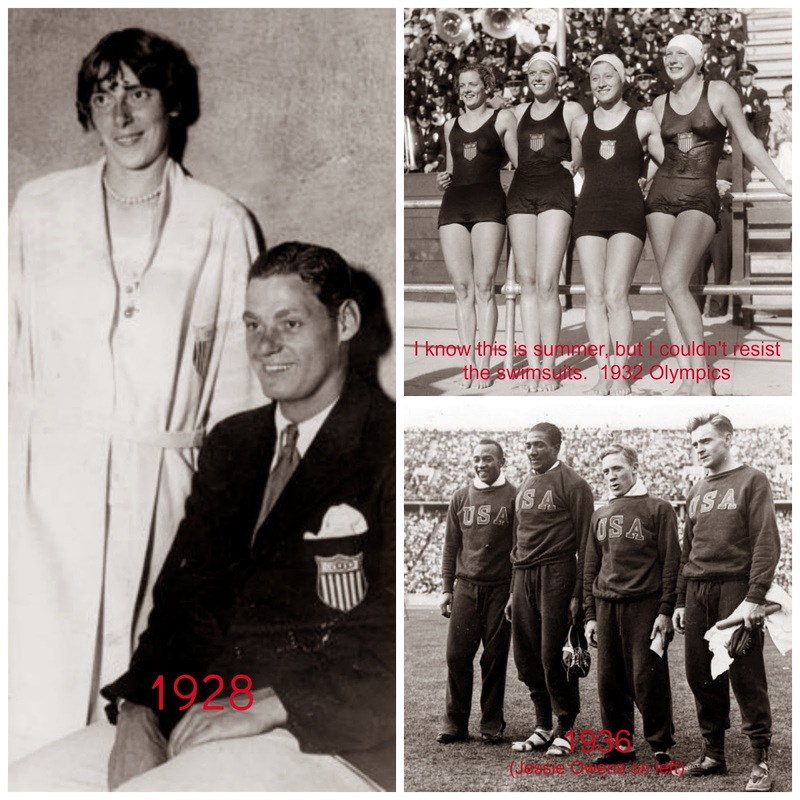 Thank you Joyce for The Wednesday Hodgepodge Questions-Volume 157! I despise the "twerk/twerking" phenomenon and definitely think it needs to be removed. NOW! Also, I would like to see "Obamacare" removed from the vocabulary but only if it takes the entire socialist program along with it. Well, I don't really do projects and I especially don't like unfinished ones. The one thing that will be done when the weather is much warmer is a revamping of our garage. It has become a catch-all and needs a good re-org, but not until a warm day in spring. Right now, I have to do some end-of-year computer work which I would rather put off, but can't and won't. I made a good potato soup for Sunday lunch and Hubby made a LARGE pot of chicken/vegetable soup that night. We will have the remains of that tonight for dinner along with a small salad. We weren't actually snowed in but close while visiting our family in northern Indiana for three weeks during Christmas. We left on Friday before the BIGGIE came in last Saturday. We left in -10 degree temps only to arrive in Louisiana 17 hours later to 59 degrees. WOW! I love the snow and love being out in it until all my extremities freeze. In fact, I have found that it is easy to become euphoric if you aren't careful. I actually shoveled the long sloped driveway the day we arrived and the day before having an MRI on my back. I know, not real smart. But, I enjoyed it so much and after finishing, I was disappointed there wasn't more. See what I mean about euphoric? Or maybe crazy? A few scenes of their back yard and cul-de-sac. We don't watch a lot of comedies. We prefer adventure when we go to the theater. I really can't remember seeing any except Bernie; however, I really didn't find that very funny. Odd, I guess, because our best friends said it was the funniest movie they had ever seen and even went back to see it with us. I am not clumsy and have never been. However, as I've gotten older, I find that my balance is not what it used to be so sometimes I feel clumsy. Aging is not for sissies! These are a few scenes from our trip into Amish country while in Indiana. We always make a trip to Shipshawana. Have a great week and I hope to get back into full blog-swing next week.